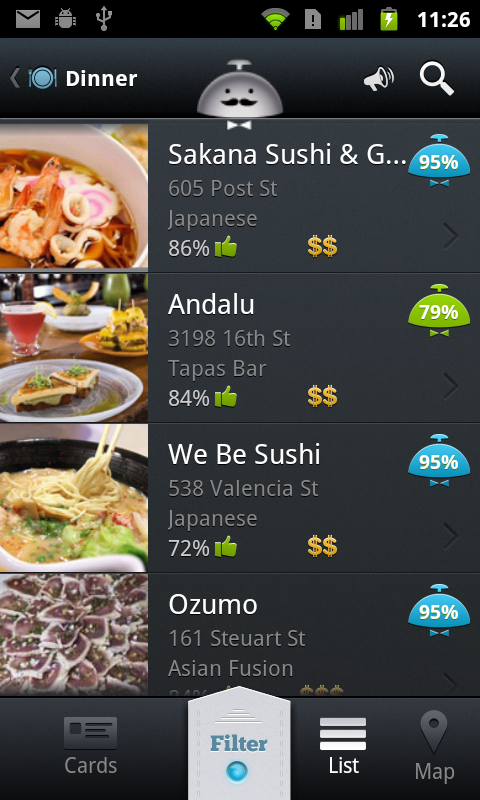 Amid talks of a Groupon acquisition, the smart local recommendations app Alfred has arrived on Android. Alfred serves up personalized suggestions for nearby restaurants, coffee shops, bars and nightclubs using a combination of artificial intelligence and machine-learning algorithms to develop personal “taste graphs” for its users. Previously an iOS-only app, the big news for Alfred’s second platform launch is not just the expanded reach, but also how the team at Clever Sense has approached the Android port. Instead of simply reproducing the familiar Alfred interface using different code, Clever Sense created a second native app specifically designed to take advantage of features and interactions found on the Android platform. On Android, Alfred looks totally different. After launching Alfred, the app walks you through the “getting to know you” quiz which asks you to teach it about some of your preferences. You can opt out of the quiz, but that wouldn’t be a great idea. Alfred’s algorithms get better the more you train them, so it’s worthwhile to give the app’s smarts a kickstart via the quiz. When you arrive on Alfred’s main screen, this is where you’ll see the most startling departure from the iOS user interface. Instead of thumbnail photos you tap (e.g., lunch, dinner, etc.) to swipe through place recommendations, there are colored circles for “Ideas,” “Profile” and “Teach.” The Ideas circle, when tapped, take you through a list you scroll through up and down to choose the category. And when you’re in a category (e.g. “coffee and tea”), there’s a toolbar at the bottom that lets you view the recommendations as cards like on iOS, on a map or as a list. It allows you to apply filters to the recommendations. The end result is a bit more of a geeky take on Alfred, which, frankly, is perfect for the Android user base. Android users are often interested in things like tweaks, customizations, and heavy personalization, thanks to the platform’s openness. There’s an enjoyment of apps, in many cases, as tools that help you get the job done, instead of “experiences” like on iOS. That’s not a bad thing, mind you, but it’s different. To date, Alfred has served up 21 million recommendations to users, up from 7 million in October. And users have liked 4.6 million places, up from 2 million. But the company won’t disclose the actual user base numbers at this time. Clever Sense had previously said that restaurants and the like was just the first step for the use of Alfred’s technology. It was looking into delivering personalized deal recommendations from sites like Groupon and LivingSocial in its next phase. That would explain Groupon’s interest in the matter. But while that would be likely be a nice exit for the company, it would be a shame for Alfred’s happy users to lose this app, especially now that it came to Android. Alfred is live on the Android Market here.